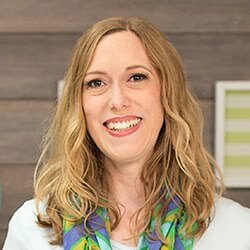 Aly Dosdall: wrmk national scrapbook day blog hop! wrmk national scrapbook day blog hop! Hello We R fans! 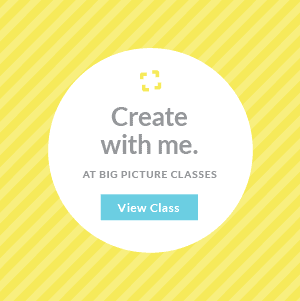 Welcome to our National Scrapbook Day Blog Hop! I'm so glad you joined me today to celebrate our amazing hobby of storytelling and memory keeping. First off I've got a fun project to share with you. I created this layout using the new Denim Blues collection. This collection is full of adorable printed denim fabric paper and die cut stickers, and it's perfect for layouts, cards, decor, DIY projects, and just about any other craft project you can come up with! I really wanted to showcase the unique possibilities of the fabric properties of this line, so I tore some strips of it and stitched them down to my kraft background cardstock with my sewing machine. I love the texture that created on my page! ETA: Since I've had some questions about the denim collection, I thought I'd clarify the this is real demin fabric backed with paper to stabilize it. It look so real because it is real fabric--so fun! To add a little textural contrast I included some wood veneer and cork elements as well. Working with the denim paper was a lot of fun, and I can't wait to create more projects with it. I've got all kinds of fun ideas in mind, so check back soon! So, is anybody interested in a giveaway?? 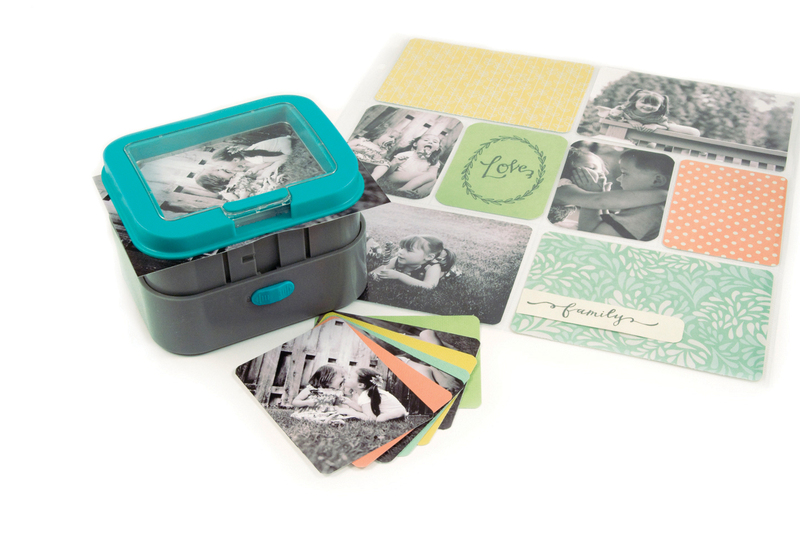 I'm thrilled to offer you a chance to win one of my go-to tools from We R Memory Keepers. The 3x4 Card Punch!! With this punch you can create instant custom 3x4 journaling cards for pocket pages using your favorite patterned papers. You can easily crop your photos to fit your 3x4 photo sleeves. 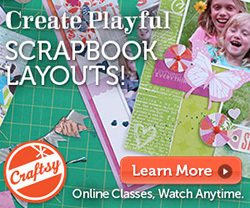 You can also make quick and easy layers for cardmaking, mini albums, or other projects. Plus you can flatten and lock the punch for easy storage. 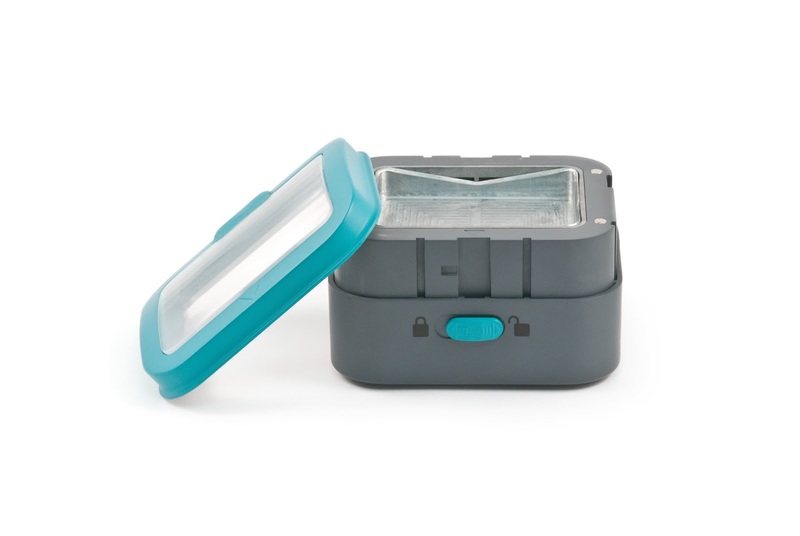 If you'd like to be considered for this giveaway please leave a comment below telling me what you would use the 3x4 Card Punch for. Comments will remain open until Thursday, May 7th at midnight (mountain time). I'll select a random winner who I will announce on Friday, May 8th. Good luck, and be sure to check back to see if you won! Here's the list of We R designer blogs to visit. Be sure to check out each one, leave them some love, and enter their giveaways! Have fun, and happy NSD! The denim is so cute!!! So exciting! I have wanted one of these for a long time. I love this punch! Very inspiring! Loving the denim! I love those various denims! What a fun way to use denim! Fabulous! Great layout! And thanks for showcasing the Denim Blues collection...I love it! And love the cork and wood stickers! I absolutely love the way you have used denim. Very unique! This is the first time seeing the denim. Love it. I would love the 3"X4 card punch. Fabulous layout! I'm going to have to keep a lookout for that denim paper! While I really like the denim designs featured, I am SUPER EXCITED about the giveaway! You have NO IDEA how much I'd LOVE TO HAVE this 3x4 punch or how long I've wanted one!!! Thanks so much for the chance to win it!! Love that Denim, Great for my rough and tough grandson layouts. Thanks for the chance to win. Great layout, I have been wanting to incorporate fabric into my layouts and cards. thanks for the inspiration. I would use the punch to crop photos and to make tags. I love all thing WRMK! Love all of your denim. So cute. I just started pocket scrapbooking this year. I am trying it for a year to see what I think. I would use the punch to get my pictures centered just right. Beautiful. I would use the punch to make backer cards for my product. Love the denim look. Think I'll use this as inspiration!! Whaaa-aaat??? Printed denim fabric paper????? I think I am in LOVE!!! What a wonderful LO you have made with this collection!! Love, Love, love this. I am a denim girl. Great idea. Thanks for sharing. 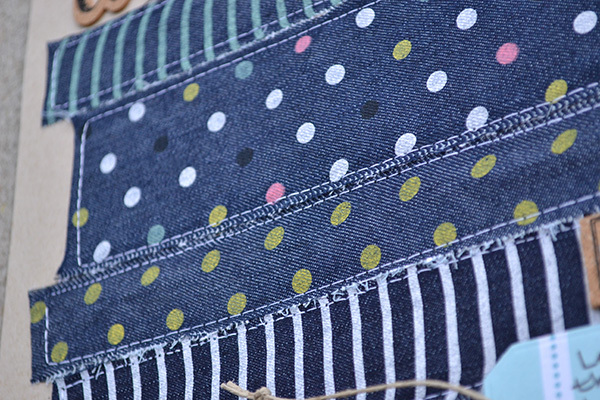 Loving the stitched denim strips, what a fantastic layout! 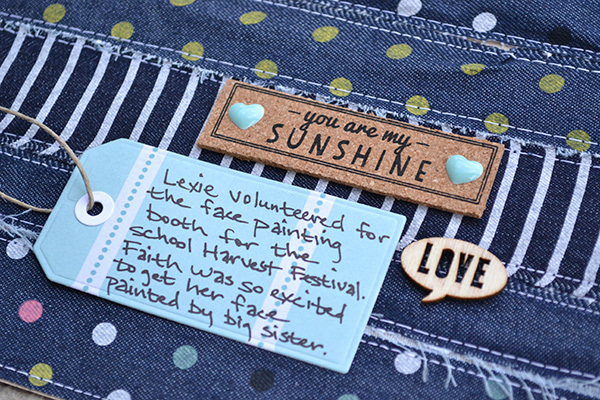 I would use the punch to create journaling tags and to get my photos cut to just the right size for PL pages. Brilliant tool! Love the denim, amazing layout! Happy NSD! Love the denim paper and the great layout. I am getting so much inspiration today. :) Would love to win the 3x4 punch... so many uses for it! I would use it in my mini baby album making. My DH is out of work at the present time. The company just let go all US employees and are bring people from the foreign owned company over to the US to run the company. I have had 3 baby showers to attend, so I am trying to use up some of my stash in making 8x8 albums rather than going and buying from their registries. Thanks for my chance to win. Such an amazing idea in your layout! Love the use of denim. And the giveaway is so cool! I would use the 3X4 punch in my classroom for making Mother's Day cards. I love the idea that they could punch out the shape themselves. It would be cool to turn the shapes into "coupons" to give their Mom's as a gift. Pretty layout! I would use this punch for my card making! Your layout is so playful, love it! Happy NSD! Stunning paper. I would love the card punch. Can use it to make fab cards to attach to my cards and to my gift bags - like mosaic. Thanks for sharing. Oh and it can be used to make tags for the men in my life! Loving your layout!!! Happy happy NSD to you!!! So many layouts want you to use 3x4 photos, especially in pre-made kits, this punch would solve so many of my scrap problems. 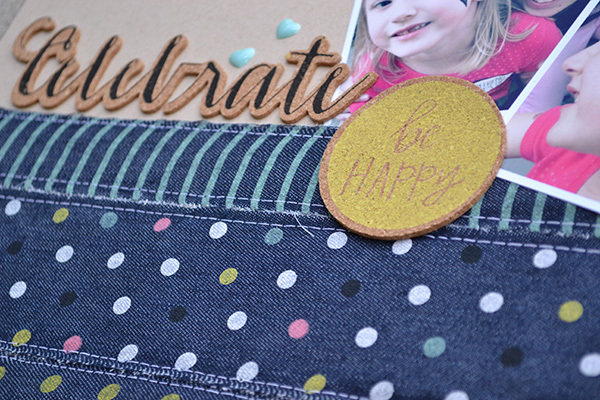 The layout is cute, and the denim patterns are awesome! Love the layout. Thanks for sharing. Love this tool you used. Wow! So is it paper or is it fabric? Interesting. What a neat project .... thanks for sharing. Gosh, I love this denim! The 3x4 punch looks so cool - so great for creating custom cards for my pocket pages! What a fun layout, love the denim strips! I would use the punch for layouts and cards. Thanks for sharing. Oh wow that denim is awesome!! So cool, love that layout! I'd use the punch to create 3x4 cards from memorabilia like brochures, maps, mail, etc. fantastic layout! thanks so much for the chance to win one of their awesome punches! Very cute layout! I can't get over how real that denim paper looks! OMG my favourite page, I just love stitching on my pages and cards. The 3x4 punch would be so handy for my pocket page travel album I need to do. Also it would help me make some cute quick gift cards. Thank you. What a cute layout! And perfect for a photo I found of my younger daughter and her friend back in kindergarten - both were wearing denim skirts and white blouses. I would use the 3x4 punch to finish my scrapbook from our time in Germany 20+ years ago! Cool denim, cool punch. Thanks for a chance to win. I love this! Thanks for the chance to win. All of the strips really highlight the "tattoo" on the little girls cheek. thanks for the chance to win something I've been wanting. your layout is FABulous-you really rocked the denim! And, i would use the punch for layouts and cards--awesome! TFS! I would use the 3x4 punch to easily punch out photos. It would definitely save some steps! Loving your denim layout! So nice!! One can never have enough tools...I say his to my husband when I "need" another crafting tool...it puts him in a great mood for buying! Thanks for the chance to own a 3x4 punch! I think the denim is a cute idea to combine with kids LO, or maybe for men... excellent, thanks for share! Love your layout! The denim is awesome! I would use the 3x4 punch in my layouts! I have been wanting one for awhile! Thanks for the chance to win! I would use the 3x4 card punch to add cut-out details to the front of my 5x7 cards. The denim and cork are fabulous. Love it!!! Thanks for the chance to win and for sharing your awesome work!!! I would love to win this! I have been thinking about starting one of these scrapbooks. I would use this to start that. Thanks for the chance to win!! I would use the 3x4 punch for Project Life and shaker cards. I would use the punch mostly for cards and hopefully layouts (I haven't scrapped in quite a while). Also my daughter could use it for creating things for her students in middle school. Denim & cork... simple divine! Love it!! Love the texture it gives to your layout! I MUST HAVE the denim papers!! LOVELOVELOVE this!! TFS! I just love your denim!! Fabulous layout! I would use the tool for cropping and making tags! Great giveaway!! Awesome page! Love that denim.... great look! Very cute! I've never used the denim look. Never thought to use denim like that. The punch tool is something I've been eyeing for a while. Thanks for the opportunity! Thanks for this great blog hop! I would have a go at making Temple recommend pictures/holders!